Ahhh, the Guitar picks… From reading some of my other articles, you may get the impression that I don’t much like these pieces of plastic. That is only half-true: in reality, I rely on them so much that my fingerpicking has suffered; you might call it a love-hate thing. play louder, or at least increase your maximum volume – this has obvious advantages for acoustic players, but also gives you a greater dynamic range, even when playing electric. 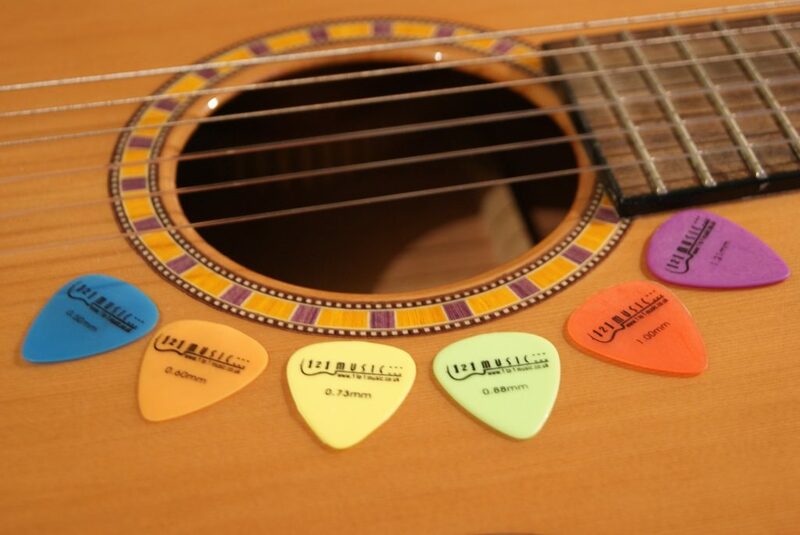 But with so many to choose from, which picks should you get? 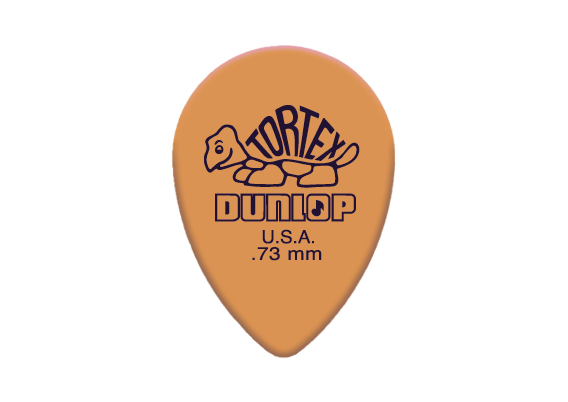 One of my teachers was a Jazz guitarist, and he had one of these tiny “Teadrop” picks. He said it gave him more control over his playing, a more direct connection to the strings. It is true that many technical players, from progressive, metal and jazz styles play teardrop shapes, including the famous Jazz III pick made by Jim Dunlop. Other players such as me find them fiddly to hold – their smallness pops out of my hand when it gets sweaty. This is probably why some guitarists, even really fast ones, go for big picks. The largest one is the Fender Triangle, played by the likes of Daron Malakian from System of a Down. But then again, he often plays a baritone guitar with heavier gauge strings – and larger picks are also popular with bass-players. Thickness is an element of the shape which is also very important. 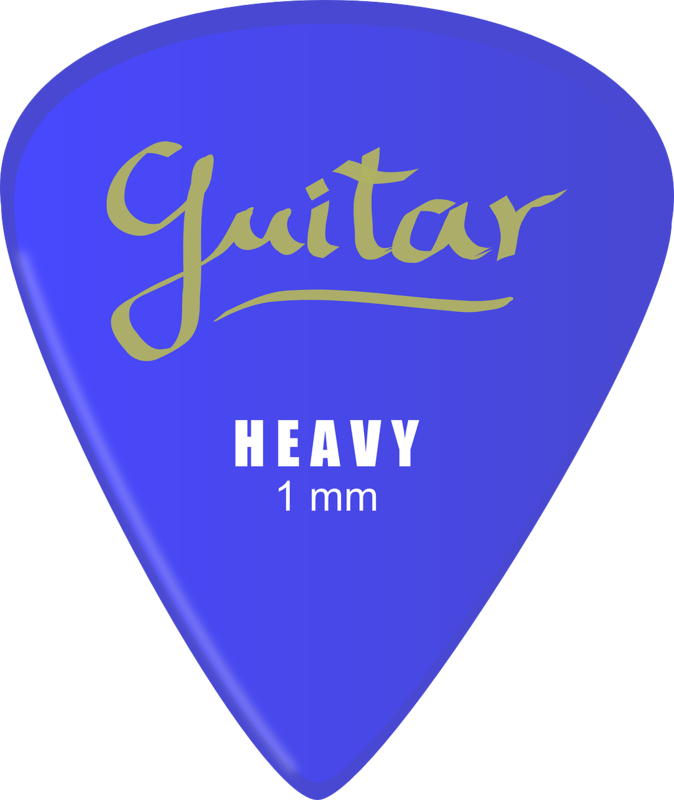 Most picks will have their thickness printed on them: say 0.53mm, which is a fairly “light” plectrum. They are often favoured for strumming work, or for a more delicate, trebly tone. 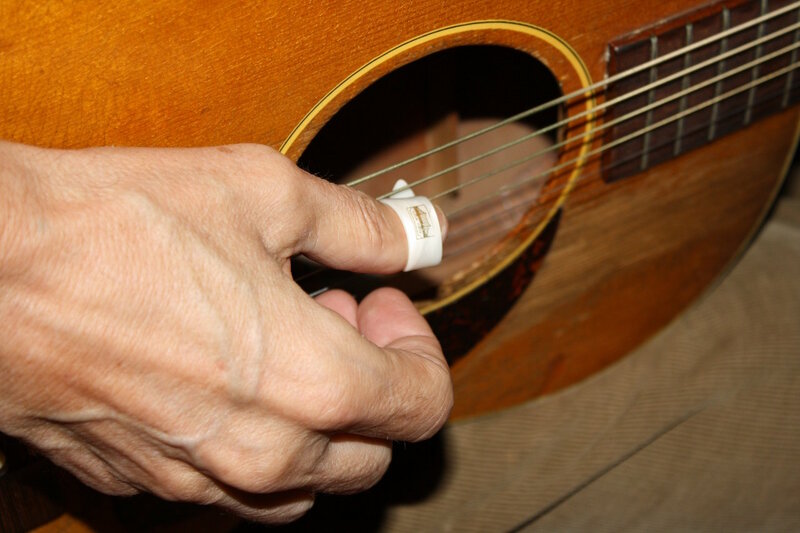 However, thin picks are not ideal for control, as they often bend and flick in unintended ways. On the opposite end of the spectrum, thicker picks yield a fuller, rounder and heavier tone, and help to articulate notes more precisely. Jazz players and fast metal players gravitate towards these, as both the round, full-end tone and speed appeals to them. In general, thinner striking surface (in other words, thin and pointy) will emphasize higher frequencies and give a more trebly tone; to get those lower overtones to vibrate, you need a thicker, rounder pick. Think about it: when you play with the fleshy part of your thumb it sounds muffled, much darker than with your fingernail. The same principle applies, and it becomes a question of finding the balance of tone that is right for you, and combining it with a shape that you find comfortable to hold. the “memory” – this refers to the extent the pick gets worn down by the strings and becomes literally shaped to the guitarist’s playing style. Nylon was one of the first materials to become popular. Used by the likes of Jimmy Page, nylon is smooth, its slick surface perfect for a clear, bright, vintage sound. 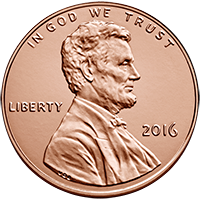 As it can be made very thin, it is frequently used for light-weight picks. Often these picks have a textured surface to keep them from slipping out of player’s hands. Celluloid is another fairly vintage pick, being one of the first materials to be used. Similar to nylon, it has an almost “oily” texture, which makes it fast and slick for a clean tone. Tortex is another very popular material, and my personal favourite. It has a matte surface and sort of powdery texture, providing good grip on the fingers as well as a darker, more solid tone. It also has high “memory”, and will mold itself to your playing after a couple of days of intense riffing. It started off as a replacement for actual turtle shell, which was banned in 1973 to protect its endangered producer, the Hawksbill turtle. Of course there are also other materials: harder ones, like glass, (semi-precious) stone and porcelain give a more focused, clear tone, and often a more beautiful and precious pick. And metal picks too – you have probably played with a coin, like Queen guitarist Brian May. He likes the tight response the hard surface gives him on the strings, and the rounder striking surface adds some colour to the tone. On the other side, there are also softer picks made from leather, felt or wood. These produce a rounder tone with softer attack, often used for strumming or warmer sounds. And there are composite picks; for instance the Dava picks, which have a sleek nylon striking zone and an easy-to-grip rubber holding zone – the best of both worlds. Let us not deny it: picks also have other purposes, the most obvious one being style. Many of us might have a pretty pick with a picture of Bob Marley on it, or have one dangling around our neck as a fashion accessory, a statement that says “I’m a guitarist”. It is almost like belonging to a tribe. And you know, that’s legit, and probably you will take the pick’s coolness into account. The famous Sharkfin picks fall into this category. No doubt it is a great pick, apparently used by The Beatles and The Beach Boys. They have three different striking surfaces (pointy, rounder and textured) for different tonal responses, as well as a concave side which you can use to slot the pick under your finger while you do some fingerpicking. But most of all, the Sharkfin is a cool “designer” pick. The one I bought when I was 15 even had a hole to put it on a necklace. And on a lighter note, because they are so cheap, they are like a guilt-free ticket into a guitar shop. I still love going into music shops, trying out guitars for ages, and then leaving after just buying a couple of picks: my favourite and another new one to try out. So, which pick is right for you? With so many options out there, it can be hard. 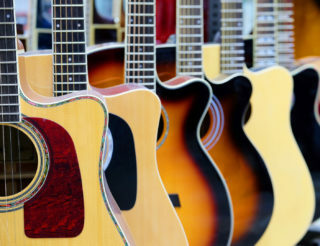 Either you know what style you want to play, in which case you can ask a guy at a music shop, or take the guidelines in this post to get an idea, depending on the tone and playing feel you are after. If I had to recommend any, I’d suggest check out Jim Dunlop plectrums or Gravity Picks, if you like something special and exclusive. But if you are reading this article, the chances are you don’t know that yet. So my advice is: go with your gut. 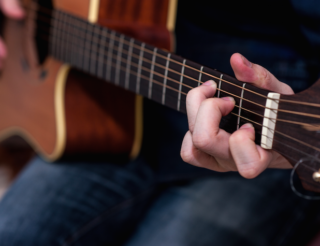 At the end of the day, the plectrum you pick (pun very much intended) ends up being more of an emotional choice – does it feel like yours, can you identify with it, does it sound like you? This matters more than the precise density of the material or the exact angle at which the point is shaped. And they are cheap, so try out! For example, have you ever tried a thumbpick? Need a video instruction on pick comparison? Check out Phil Ockelford explaining different picks and their effect on tones. Thanks for this great piece! I am a guitar teacher and I usually refer my beginner students to this webpage as I find it really useful to teach them how to choose the right pick for them and what they will sound like.